Rosemary has been used for centuries to not only stimulate hair growth but also delay graying. This is according to the University of Maryland Medical Center. We have included Organic Rosemary oil in our SPRING Scalp First Oil Treatment . Rosemary oil can counter hair loss by stimulating blood circulation in the scalp, which, in turn, promotes hair growth. 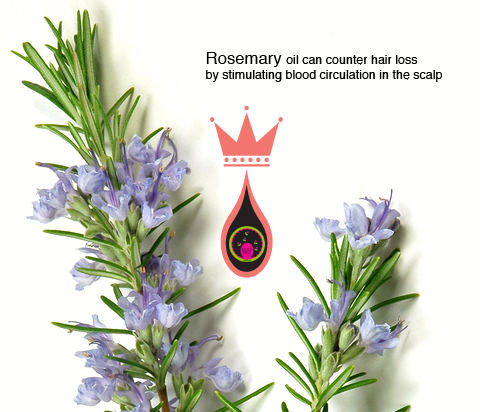 The oil from the Rosemary helps clean the hair follicles by unclogging them. Clogged follicles often lead to problems like dandruff, and, in extreme cases, hair fall. Rosemary is a natural alternative to Nioxin© and other topical Scalp Treatments. Men use our Hair and Scalp Oils for added Scalp Stimulation. This is only one of the Organic ingredients in Spring Blend. -Rosemary is pretty amazing.